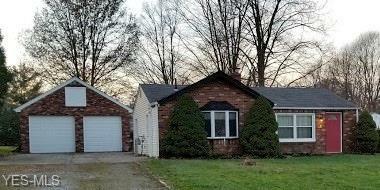 Charming 3 bedroom Ranch offers an abundance of space all on one floor in Brunswick Ohio. Eat-In Kitchen has new floors and a bay window. Hot water tank and Central Air is New in 2018! This home sits on a little over a half acre and has a beautiful brick patio out back along with an outdoor fireplace for toasting marshmallows. The oversized two car garage on this home is a hobby mechanics dream. Walls are cinder block and a steel beam stretches across the center and could easily support heavier loads than a traditional garage. Brand new pull down aluminum steps give access to ample storage in the loft area above the garage.